A mermaid wedding dress has a fitted skirt that flares out at the bottom. Typically, a mermaid-style wedding dress has a relatively short train, which means that the bustle is either on the outside of the dress or underneath the skirt of the dress. 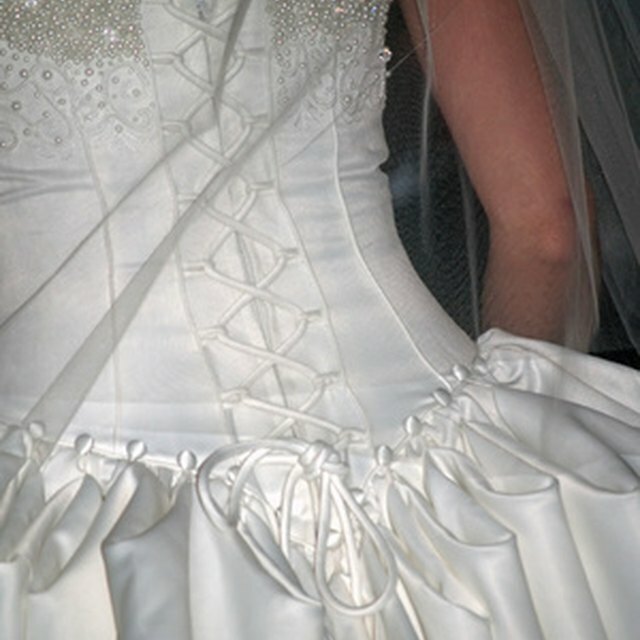 The bustle outside of the dress is an “over bustle” and a bustle underneath the skirt of a wedding dress is an “under bustle.” According to Heritage Garment Preservation, it is common for bustles to be custom made because they must be fitted to the hem of the skirt and the height of the bride. Put the wedding dress on. Have an assistant pick up the skirt of the dress and pin it so you can determine where the bustle buttons and loops should be sewn on to the dress. Measure to about the midway point on the train of the mermaid dress. Have your assistant pick up the dress at this point and pull it up so that it meets the top of the part where the dress starts to flair out. Place a straight pin in the train to mark the area where the loop or loops need to be sewn. Place a straight pin on the top of the train where the buttons need to be sewn. Place the mermaid dress on a flat surface so that the back of the dress is facing up. Sew one fabric-covered button in the center of the top part of the train. Sew the matching fabric-covered loop on the area of the train you will be hooking to the dress. If you prefer, sew two buttons about an inch apart at the top of the train and two loops. Put the dress on and have your helper pick up the center bottom part of the train and fold in under the dress until it picks the train up off the floor. Put a straight pin on the inside part of the dress where the train bottom meets it. Take the dress off and turn it inside out. Sew a loop to the center bottom of the train. Sew one to two buttons on the inside of the dress where the train should meet it when it is bustled. On the under bustle, you can sew the buttons to the lining of the dress or directly to the dress. If you sew it to the dress, do not sew all the way through to the outside.